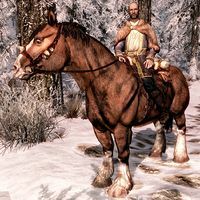 The male Noble is an Imperial citizen who is often seen on horseback accompanied by a lone Imperial soldier and wandering across Skyrim's holds. He will refuse to speak to you and threatens to order his bodyguard to attack, stating: "I have nothing to say to you. Now move along, or I'll order my guards to attack." Despite his threats, he or his guard will not be hostile anyway. If his guard dies, he will still be snooty, although more humble: "Keep away. If I am harmed, people will come looking." His attire matches his status and consists of fine clothes and a pair of fine boots. He wields a leveled dagger of the best possible quality. A female Noble with the baseID 00102D63 was meant to be involved in the same random encounter, but was not implemented in the final game. This page was last modified on 10 June 2016, at 00:53.